Brexit is a word which is made by combining the word “Britain,” with the word “exit” – exit in reference to the United Kingdom of Great Britain leaving the European Union (EU). Brexit started after a referendum called by David Cameron in 2016, when the then Prime Minister thought he could deliver a “remain” victory. He was defeated, and resigned ignominiously, leaving the country in a mess. Despite not having a plan, or any kind of idea, Cameron’s replacement as Prime Minister, Theresa May, enacted Article 50, which meant that the UK should leave the EU on 29 March 2019. She went on to reduce a Parliamentary majority in a monumentally ill-advised General Election, and somehow remained in power, despite seeing “her” Brexit deal defeated twice in the run up to the 29 March. She also survived a vote of no confidence in early 2019, most likely because there was even less confidence in her likely successor, the Victorian mock-twerp (who is actually a very intelligent money making animal), Jacob Rees-Mogg, or the faux-buffoon (of a similar ilk) Boris Johnson. At the time of writing, around 2 weeks from that date, Britain still has no idea what it is going to do about Leaving the EU. Brexit is making Britain a laughing stock, globally. 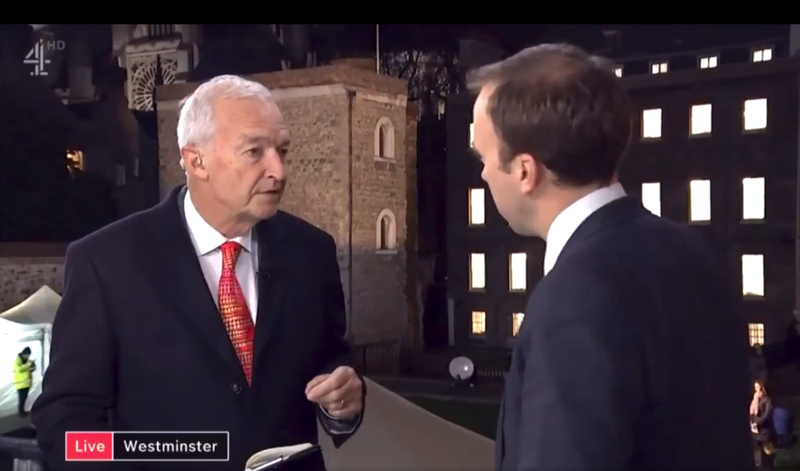 Meanwhile, in the United Kingdom, journalist Jon Snow (not the Game of Thrones character) has been manhandling mealy-mouthed politicians on national TV.